Эта программа отвечает на вопрос слушателя из Вьетнама, который беспокоится о своём коте. Коту уже 17 лет, он постарел и кажется ослабленным. Мышей уже не ловит. Долго ли ещё протянет на белом свете? Слушателю отвечает ветеринарный врач: - В настоящее время, при условии полноценного питания, хорошего медицинского обслуживания и жизни в безопасных условиях, кошка может дожить и до 20 лет. Для сравнения, на воле кошка живёт около семи лет. Статистика свидетельствует: в настоящее время дома кошек заводят чаще, чем собак. Гн. Брэдшо изучает кошек уже больше 30 лет. Он опубликовал статью в газете Вашингтон Пост, в которой утверждает, что кошки используют свои хвосты для общения друг с другом. Если кошка хочет сказать, что она в настроена дружелюбно, она поднимает хвост вертикально вверх. Другие кошки воспринимают этот сигнал и нередко отвечают тем, что тоже приходят в дружеское расположение духа. Найдите время, прослушайте аудио-клип на английском языке. Темп речи вполне приемлемый, и не забывайте, что Вы можете проверить понимание, следя глазами за текстом на английском, он под катом ниже (IN ENGLISH). В аудио-клипе можно почерпнуть много интересных сведений о поведении и потребностях кошки. Как она сигнализирует, что вы ей нравитесь? Или не нравитесь? Что значит мурлыканье? Как определить, счастлива ли кошка? Не захворала ли? Не подвержена ли стрессу? Нравится ли ей, когда её гладят? Достаточно ли вашей кошке свободного пространства? 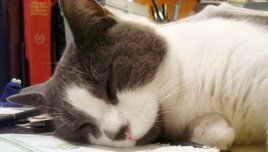 На все эти и многие другие вопросы отвечает программа VOA (Voice of America) All About Cats - The World's Favorite Pet. From VOA Learning English, welcome to As It Is. Hi again! I’m Kelly Jean Kelly. To answer the question, we spoke to Elizabeth Colleran. She is a veterinarian -- a doctor who treats animals. She owns two veterinary clinics on the west coast of the United States. Her clinics specialize in cats. Dr. Colleran says she once thought 17 was very old for a cat. In comparison, she says, cats in the wild live only about seven years. On the subject of cats, two American newspapers recently described new research about the world’s most popular pet. That is correct — more people have pet cats than pet dogs. John Bradshaw directs the Anthrozoology Institute at the University of Bristol in Britain. He has studied cats for more than 30 years. Mr. Bradshaw wrote in the Washington Post that the animals often communicate with their tails. When a cat wants to show it is feeling friendly, it lifts its tail straight up. 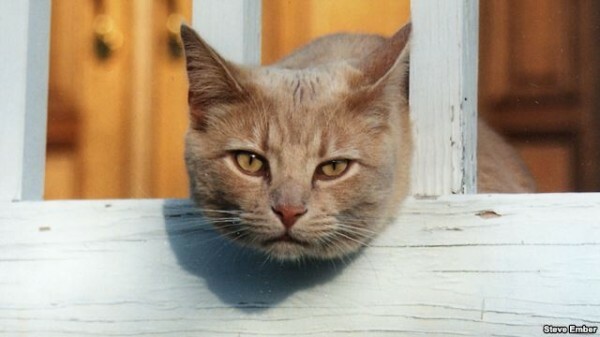 Other cats recognize the straight-up tail symbol and often respond in a friendly way. Elizabeth Colleran says pet owners can learn to recognize tail movements and other signs that a cat is really happy to see you. If your cat does not feel like seeing you, she says, he will just walk away. Purring is another way cats communicate. 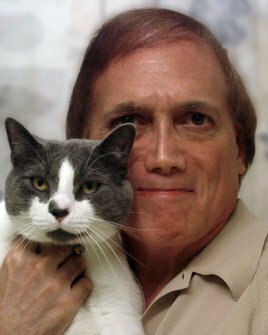 John Bradshaw says most cat owners think their cat’s purr means he or she is happy. Often that is true. But, he says, cats may also purr when they are hungry, worried, or even angry. He says a purring cat is asking the observer to sit quietly with him. The purr makes the cat feel better. And, Dr. Colleran adds, it may also make the person feel better. 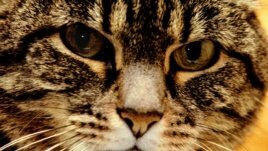 Some researchers in Austria also recently examined what makes cats stressed. In other words, what makes cats anxious or nervous. The researchers work at the University of Veterinary Medicine in Vienna. They studied 120 cats that lived in 60 houses. Some cats were the only cat in the house. Others shared the house with one, two, or three other cats. The researchers wanted to know whether cats felt more stressed when they lived alone or as part of a group. The scientists did not find the exact answer they were seeking. The number of cats in the house did not seem to make much difference to a cat’s stress level. However, the scientists found that other things did influence stress levels. Cats could show stress if they were not at ease with human beings, did not have enough space, or did not have enough food. In addition, the researchers found that most cats liked being touched, or stroked, by humans. A few did not. As Elizabeth Colleran suggested, those cats probably just walked away from people who reached out to touch them. Thirteen of the cats did not like being stroked, but they let people touch them anyway. The researchers found that these cats showed more evidence of stress than the others. Dr. Colleran says that humans can do a lot to make sure their cats have happy lives. 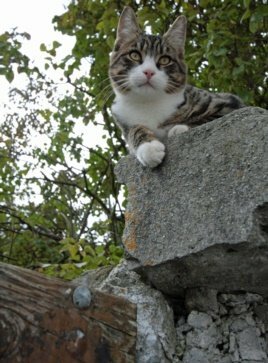 Most house cats, she says, need places to hide and places where they feel safe to eat and drink. In other words, they need some privacy. But she notes that they also need to play. Sometimes, a cat will get sick. Dr. Colleran says it can be hard for humans to realize when their cat is not well. She suggests looking for any changes in how your cat is acting. For instance, you might find your cat in a room he has never been in before. Or, he may sleep in a new place, or start to eat less. Dr. Colleran says take your sick cat to the veterinarian, even if the experience is unpleasant for both of you. Let your cat ride in the car -- sometimes just for fun, she says. And let him play or sleep in the cat carrier at home. That way, the cat will be more relaxed when you take him to the veterinarian. And that’s As It Is. I’m Kelly Jean Kelly.